WHEN: Opens Friday, Oct. 22, at 7:30 p.m. Additional performances on Oct. 23 and Oct. 26 through Oct.30 at 7:30 p.m., with a matinee performance on Saturday, Oct. 30, at 2 p.m.
WHERE: All performances take place at the Wells-Metz Theatre in the Lee Norvelle Theatre & Drama Center at 275 N. Jordan Ave. No photography or recording of any kind is permitted during performances. This production includes mature content. TICKETS: Regular admission is $22 for adults, $15 for students, $16 for senior citizens; Student Rush prices available with cash and a valid student ID an hour before each performance. BLOOMINGTON, Ind. 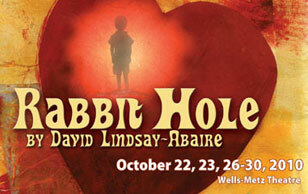 -- The Indiana University Department of Theatre and Drama continues its 2010-11 season of award-winning plays at the Lee Norvelle Theatre & Drama Center Oct. 22 with Rabbit Hole by David Lindsay-Abaire, the 2007 recipient of the Pulitzer Prize for Drama. Directed by IU Associate Professor of Acting and Directing Fontaine Syer, Rabbit Hole is the second play of the season and is the first to take place in the intimate space of the Well-Metz Theatre. This tale of a family who must come to terms with the accidental death of a young child explores the issues of grief and acceptance that follow the too-early loss of a loved one. Sometimes angry, often funny, but always humane, Rabbit Hole delves into the questions of how people experience pain, both individually and collectively, and demonstrates the power of love in the healing process. Syer believes that theater can be a powerful medium -- one used alternately as an escape mechanism or, in the case of this production, as a tool for making sense of real life. There are moments of pathos, she notes, but also the mundane hilarity of everyday existence. "The play is about five very specific, complete, and full human beings," Syer said. "It's also very funny and filled with behaviors we can all recognize." Potential theatergoers should not be turned off by the dark subject matter, Syer said. "Rabbit Hole is hard to describe because the plot sounds very grim -- a family dealing with the death of a child -- but the experience of seeing the play is so much more than just the plot. These people change. [The characters] are very different at the end of the play than at the beginning." Stakes are high for the actors who are performing these intense scenarios, and viewers will go on the emotional journey with a veteran cast of graduate student actors from the Department of Theatre and Drama. Playing grieving parents Becca and Howie are third-year M.F.A. acting candidates Abby Rowald (A Little Night Music, Marat/Sade) and Shewan Howard (Major Barbara, American Ma(u)l). Third-year M.F.A. acting candidate Sarah Fischer plays Izzy, Becca's younger sister, and third-year Ph.D. candidate Sarah McCarroll (As You Like It, An Ideal Husband) is Becca's mother, Nat. Rounding out the cast is second year M.F.A. acting candidate Jaysen Wright (Take Me Out, As You Like It) as teenage driver Jason. Joining the cast is an experienced team of both professional and student designers. Faculty contributions include those of Robert A. Shakespeare, professor of lighting design, and Linda Pisano, associate professor of costume design. In charge of scenic design is third-year M.F.A. candidate Nick Passifume; undergraduates Michael Goodpaster and Alissa Litell are teaming up to design sound; and second-year M.F.A. candidate Scott Wolfson is the technical director for the production. To see information about the entire cast and production team, in addition to details about the rest of the 2010-11 Season visit theatre.indiana.edu. Interview requests should be directed to John Kinzer, 812-855-0514 or jkinzer@indiana.edu.